FEATURE: Demi Lovato: It’s Complicated: Do We Put Too Much Pressure on Young Artists?! Do We Put Too Much Pressure on Young Artists?! and her family have asked for privacy at this difficult time; there was shock and upset yesterday on learning Demi Lovato had been rushed to hospital following a suspected heroin overdose. Social media lit up with sympathy and concern; fans and high-profile figures sending their best wishes and love to her. Although the full details have not been revealed – the cause of her hospitalisation has not been revealed – it is troubling seeing a bright young star put into the news because of such a horrible event. It is not to me or anyone else to guess why Lovato was taken to hospital or the circumstances leading to it but one thing that shocked me was the way some corners of social media reacted to the news. Rather than show humanity and wish the American artist a speedy recovery; there was a sense of apathy and humour – someone who has admitted to taking drugs in the past, in their way, deserved it. Others felt it was wrong to show such concern for someone who had put themselves in that position. Those people were swiftly shut down and admonished but it is concerning seeing so many young artists pushed to the extreme. Demi Lovato is on the third leg of her Tell Me You Love Me World Tour and has been heavily involved with touring – barely able to catch a breath due to the demand. The twenty-five-year-old has been open regarding drug problems in the past. She has suffered alcoholism and an eating disorder after spending a year in a sober-living facility; the star has talked about cocaine and how, in a way, it has helped her cope with her bipolar disorder. In the documentary, Demi Lovato: Simply Complicated, she talked about her troubled times and overcoming the worst days. Drugs were discussed but the documentary set out to show the real Demi Lovato: the hard times and troubles she has had coupled with the strength from her fans and determination to record and take her music around the world. The documentary was a candid look at her school days and the bullying she suffered; her dating life and the ups and downs; the demands of touring and her everyday life. Lovato was scheduled to perform in Atlantic City tomorrow (Thursday) and head to Latin American for the final leg of a fifty-two-date tour. One cannot truly know what is happening in Lovato’s life right now but she is one of the biggest names in Pop. Her 2017 album, Tell Me You Love Me, was her sixth album in nine years and, between releasing albums, there is the touring and press. Demi Lovato is an artist who acts as a role model for her fans. She has battled illness and addiction but continues to perform and take her music to the audience all around the globe. The strength and determination to keep on playing and creating is not something many people could do. Rather than dwell and hide away; the Popstar has spoken about the realities of her situation and bravely opened up about her darkest days. Although the modern music scene is a tough battleground and it is challenging getting your music out there; I wonder whether we need to look at the expectations put on modern artists and the effects it can have. It is, as I keep saying, not to anyone to say what led to Lovato’s hospitalisation but the talented songwriter has faced enough problems over the years. Whilst she cannot take that much time off and rest between releases; it is heartbreaking seeing news like yesterday’s come out. She loves music and adores her fans but she could not have had too much time to unwind and find time for herself since her first album arrived in 2008. Each record involves rigorous and extensive publicity; there is the promotional trail and then the release itself – after which, she would tour through the U.S. before going abroad. “For you, has music been a way to move forward? Music has been very healing for me. It’s been a part of my life that’s really helped me cope with certain addictions and certain emotional issues, and death, and loss through breakups. And also creating memories. I’m at a different place in my life now, where I’m a single 25-year-old woman coming into my own and living on my own. So I’ve become lonely at times, and I’ve written about it. It’s definitely helped me”. “It’s a case-by-case scenario. For me, it was important to jump in early, because it saved my life. I was bullied, and I didn’t feel like I had much to live for other than music. So jumping into it was something that saved me. If I were to have kids and it wasn’t a life or death situation, I’d tell them to wait and grow up a little bit before they tried to pursue something that can be challenging for someone that’s young”. We cannot really monitor every mainstream star to check they are okay but I feel there is still too much demand placed on the artist. You hear about artists suffering anxiety and burning out due to constant performance; others who are unable to switch off and spend endless time on social media – fuelling a sense of anxiety and not helping with their mental-health. Modern music is a constant game of promotion and image. Even if you are an authentic and open artist; you can never really escape the spotlight and the fact so many eyes are on you. The sort of reaction Demi Lovato received yesterday shows there is a lot of love out there for her – there is a camp that turns their nose up and feel we should not feel sorry. The mentality and physical strength needed to survive in the mainstream and remain vital is incredible. 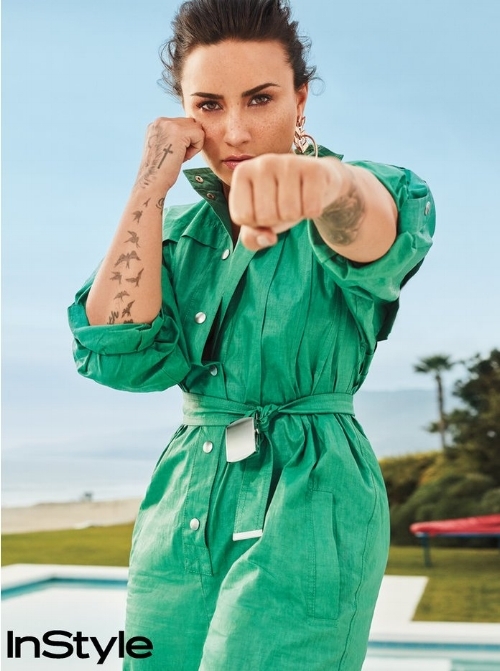 Although Demi Lovato boxes and is a blue belt in jujitsu; you can only imagine how draining touring is for someone like her – even for someone very fit and physically strong. Having to handle a mental illness like bipolar is hard in itself - there is the touring lifestyle and being in a new place every day. That is part of the machine and process but it is the sheer volume of gigs and how hard artists have to work. “…And though she loves her fans and loves to tour—saying she gets butterflies only if “there’s someone I like in the audience”—meet and greets before and after concerts can be tough. “They’re very emotional. A lot of times people use that opportunity to dump their problems on me because they don’t know who else to talk to,” Lovato says. “They show me their cuts. I’ve had people come up to me and say, ‘I was going to kill myself until I got this meet and greet.’ And you’re just like, ‘What?’ Sometimes I’ll meditate afterwards. Sometimes I’ll just kind of breathe. I used to sage myself. It’s very heavy”. That interview is a great piece where Lovato talks about exercise and speaking out against the bad in the world; being a role model and how she deals with stressful times. The photos show her tough and ready to swat away all-comers: a lean and confident figure ready to take anything on. I wonder how our perceptions of artists on the page and in interviews differ to that of real life. As I mentioned; with each album comes a tour and there is the balancing of personal life with music. Artists like Lovato have huge armies of fans on Instagram and they need to be kept in the loop. She has interviews and being shuttled from city to city. THE best thing anyone could do.